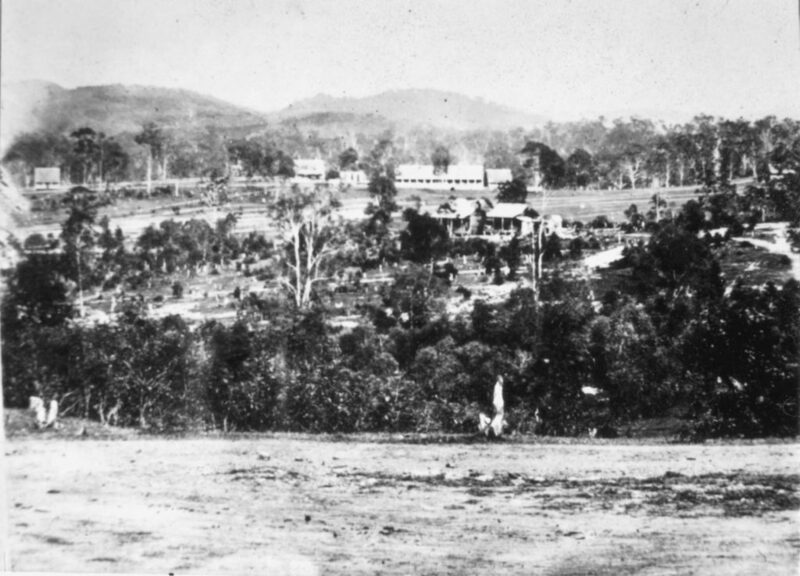 Upper Coomera is located in the Gold Coast region and was first explored in 1827 by Captain Patrick Logan. It was initial a prominent area for its farming of sugar and maize and timber-getting for red ceder. However, by the 1950’s half of the agriculturalists were dairy farmers and there were also a few banana and fruit farmers[i]. 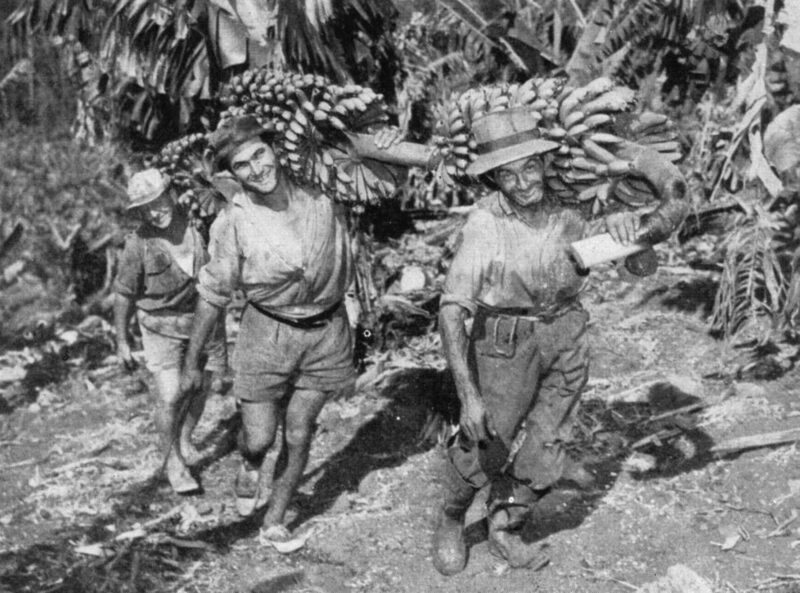 One of these Banana farmers was George Chester, also known as the ‘Banana Case Baron’. He claimed to be the largest single banana producer in the Commonwealth, growing up to 35 tons per week. He also owned a sawmill in Pimpanan, where he would manufacture the banana cases and use the surplus timber to build new homes, largely in the suburb of Mt. Gravatt. 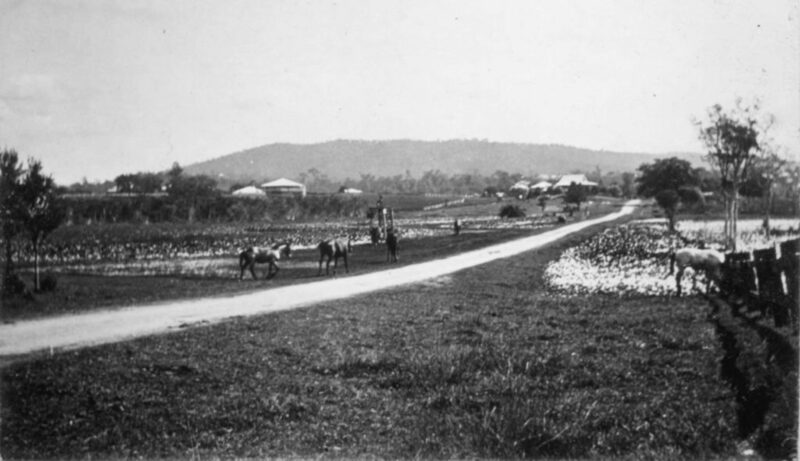 He would become the first Brisbane’s sub-divider and home building[ii].Many of his workers were Italian migrants, who lived in rent free homes and arracks that he built for them[iii]. 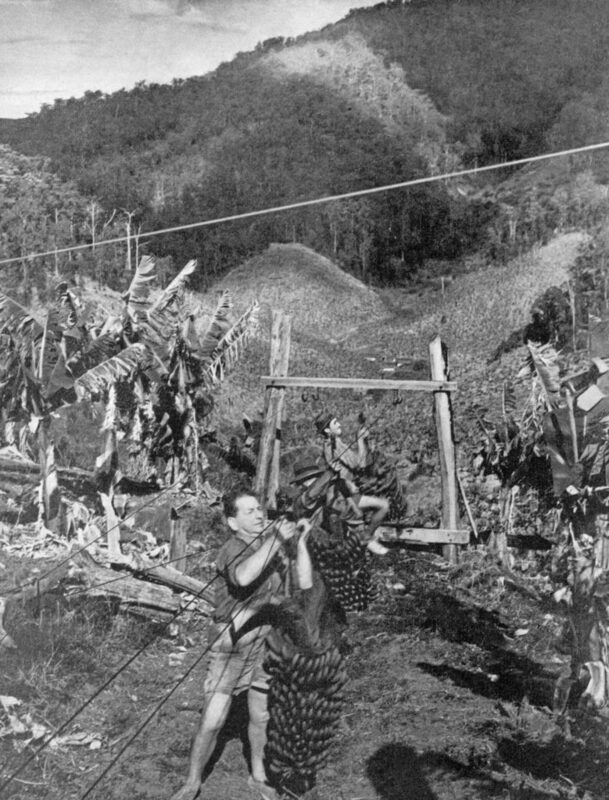 Bunches of Bananas being attached to the “Flying Fox” on Mr. G Chester’s plantation, Upper Coomera 1954. William Thomson Waddell, son of Allan and Margaret Waddell was born and brought up in Irvinebank, a rich mining town in North Queensland, where he spent five years apprenticed to Irvinebank M CC(Contract Mining and Services) and became an engineer. In August 1914 he took part in military training in Cairns, Townsville, Thursday Island and Port Moresby, (at the time when Australian seamen landed in German New Guinea and captured 7 Germans and 20 natives). During this exercise he criticised the organisation for having only 12 WCs for 1200 men. The unit was disbanded. 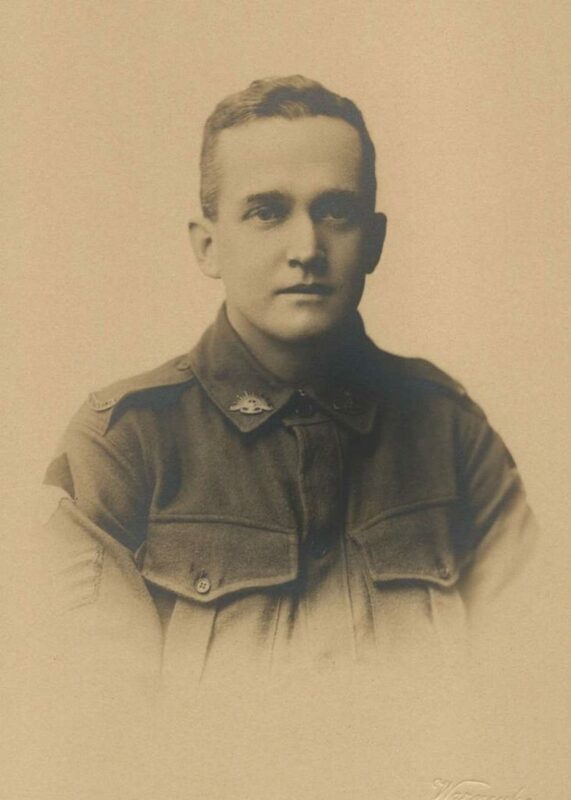 By 4 June 1915, this fair skinned, blue-eyed, dark haired, sturdy Australian of twenty-four years, medically fit and determined to serve, was enlisted in Brisbane as number 1768 and joined the Second Reinforcement to the Twenty-fifth Battalion. 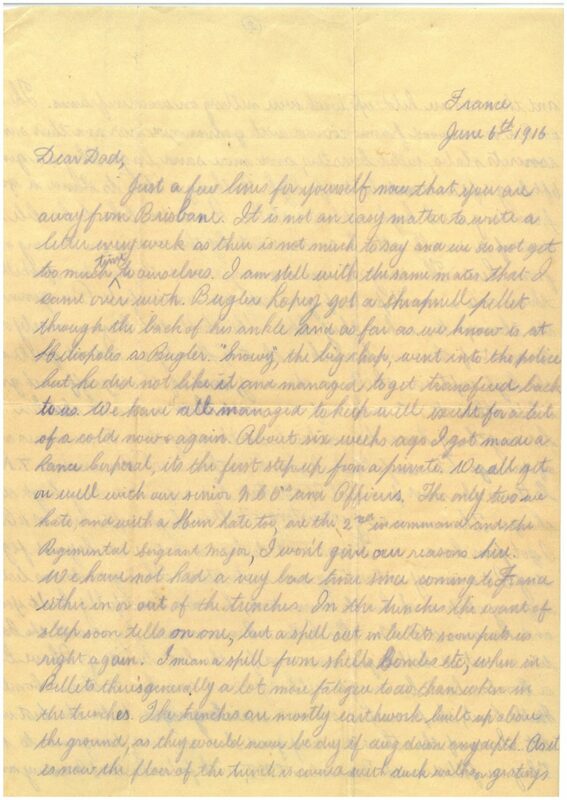 Throughout his army career he wrote to his family, especially his older brother Allan Ferguson Waddell and several of his hand written letters are in the archives of the RHSQ where they are treasured and made available for serious research. … About six weeks ago I got made a Lance Corporal, it’s the first step upfrom a private. We all get on well with our senior NCOs and Officers. … The shell the Germans rely on to do most of their work with is the 5’9″ Howitzer. … if they hit anything hard like a brick wall they do a tremendous amount of damage. … Both sides use a lot of white flares at nights. The German ones were supposed to be superior to ours, but I don’t think there is much difference now. … Both sides have parachute flares which go up about 100 ft and then comedown very slowly. … Where we are just now we can get a quart of fresh milk for 3d. We are fed fairly well by the authorities but there is not enough bread.The biscuits are as hard a[s] rocks, … Up till about a month ago we had an issue of rum once or twice a week but it has been cut out. … I get letters from Mother, the girls and Gus almost every week. The mail gets mixed up sometimes and then they come all of a bunch. I have a letter from Isabel Moffatt that I will answer as soon as possible. Give my kindest regards to Mr and Mrs Moffatt, Bessie and Isabel. William was wounded with a gun shot wound to his right leg at Pozieres in July 1916.After treatment in France he was sent to war hospitals in England and once fit for duty rejoined the 25th Battalion on 23 December 1916. Soon after his return he was promoted to corporal and very soon after to lance sergeant. Wounded on the left thigh on 18th September 1917 at Passchendaele he was transferred to the 53rd General Hospital and from thereto England where he was admitted to the Middlesex War Hospital. Allan Waddell, was advised on 8th November 1917 that Lance Sergeant W T Waddell was admitted to ‘County of Middlesex War Hospital 23/9/17 suffering from gun shot wound left side, severe’. On the Western Front the second division with Allied counter offensive forces crossed the Somme at night on 30 August 1918 led by General John Monash and broke lines at Mont St Quentin and Peronne. After changing the plan of attack somewhat the allied forces, including 25th battalion, AIF, recaptured Mont St Quentin over three days. Although 20% of their men were lost in casualties, the battle was considered one of the finest achievements of World War I. Sadly, in this battle, so close to the end of the war, on 2nd September 1918, Sergeant William Thomson Waddell was killed in action. His body was temporarily buried near a shell hole and some barbed wire but it was later exhumed and Allan Waddell was advised that ‘William Thomson Waddell’s remains were re-interred in Peronne Communal Cemetery Extension with every measure of care and reverence in the presence of a chaplain’. On 10th May 1919 Margaret Taylor Waddell signed a receipt for ‘one package containing the effects of the late No. 1768 Sgt W T Waddell [her son], 25th Battalion in good order’. Then on 2nd September 1921 Allan Waddell received a copy of the Memorial Scroll and on 21st November 1922 a copy of the Memorial Plaque. As next of kin Allan Waddell received his son’s medals by 28th May 1920:the 1914-1915 Star, the British War Medal and the Victory Medal. RHSQ Archive Boxes 55 and 93.